Since we were watching some other missionary kids last weekend, we decided to stay on campus at their house. So we drove to campus early Sunday morning in order to attend Light of the World Church in Buwundo village. This is the church that was begun by some employees at Good Shepherd's Fold. There had not ever been a church in this local village, so several employees and the missionaries here began to pray. Soon a few of the men on staff at GSF started a Bible study. That Bible study continued to grow and in November of last year they began meeting on Sundays for worship. Worshipping here is very different than in our traditional churches in America. The first difference is that we sing in at least two different languages. The sermon is actually translated from English into two other languages, Luganda and Luo. Although that sounds very cumbersome, it really flows smoothly. And it gives us a little picture of heaven where God will be worshipped by every tribe in every tongue. Another difference is how physical the worship is. There is much clapping and drumming and dancing before the Lord. This time of singing worship songs is about an hour, which is very different from our standard 3 song set at our church in America. Although that part of the service took much longer, the children didn't seem to mind since they were dancing. Zeke particularly enjoyed the worship here. He loves clapping and dancing! A third difference is that we walk to church. People in the local village do not have cars; they just walk wherever they go. So the church is not along a road, but along a footpath. We all walked about 15 minutes to church. It was a beautiful walk with lantana flowers and banana trees and all kinds of beautiful plants along the way. It was also nice to meet people from the local village who were walking to GSF to get clean water. I hope that they will eventually join the congregation at Light of the World. 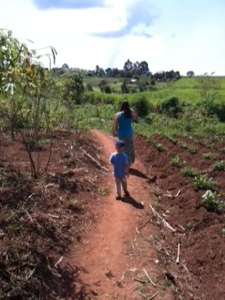 Here is a photo of our walk. A fourth difference is that there is a time for someone to share a testimony before the sermon. This week a woman shared that she was thankful to God that she and her one year old son were at home in the village when he died. He had a heart defect and was in need of a surgery that could not be done here in Uganda. GSF was trying to get him into a program where he could be flown overseas for surgery, but before he was accepted into that program, he passed away. The mom was thanking God for the grace of being near family and friends rather than alone on an airplane or in a foreign country when he died. Please pray for comfort for this woman, her family, and the staff at GSF as they grieve the death of this boy. I am amazed and encouraged that she was able to publicly thank God for his grace in the midst of this loss. It reminded me that even in the midst of significant trials, we can always thank God for something. Another difference in the church here is the children's church program. The children leave after the hour of worship for their own lesson during the sermon. That in and of itself is not so different. When the children leave the church building which is made of eucalyptus poles and papyrus mats, covered with tarps, they go to a small area with a shade and sit on a mat, or the dirt if they are my sons, to listen to their Bible story. Caralina Gwartney, one of the older missionary kids who attends our school at GSF, teaches the lesson. She was speaking while another child was translating. Zeke was having trouble sitting still so Caralina asked him to come sit near her. Well, Zeke apparent thought she was asking for a second translator. Caralina would says a sentence or two, the child on her right would translate into Luganda, and then Zeke, sitting on her left would attempt to repeat the translation, or maybe he was translating into Luo. The children all thought he was hilarious, and he apparently continued with his "translating" for quite some time. I am very thankful for Caralina's patience and sense of humor! 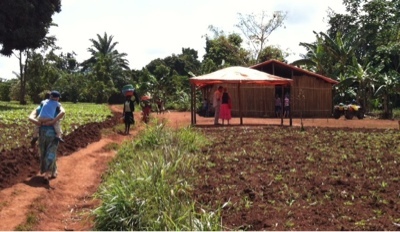 Below is a picture of the church building and the shaded area for children's church. Apparently our Zeke feels just as comfortable worshipping in the village in Uganda, Africa as he does back in Watkinsville, GA. I am very thankful for his cheerful, outgoing personality! Everyone on campus at GSF already knows Zeke's name, and I'm sure that before long, the same will be true in the village too. 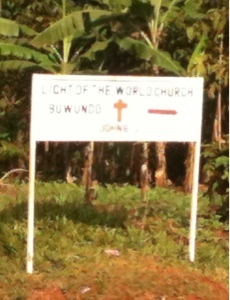 As you pray for us, also pray for the congregation at Light of the World church in Buwundo village. This week we will be back in Jinja for worship, but we look forward to being a part of the congregation here when we move onto campus. As you worship the Lord this weekend, remember that you are joining your voice with many others all over the world worshipping our amazing God in many languages together!